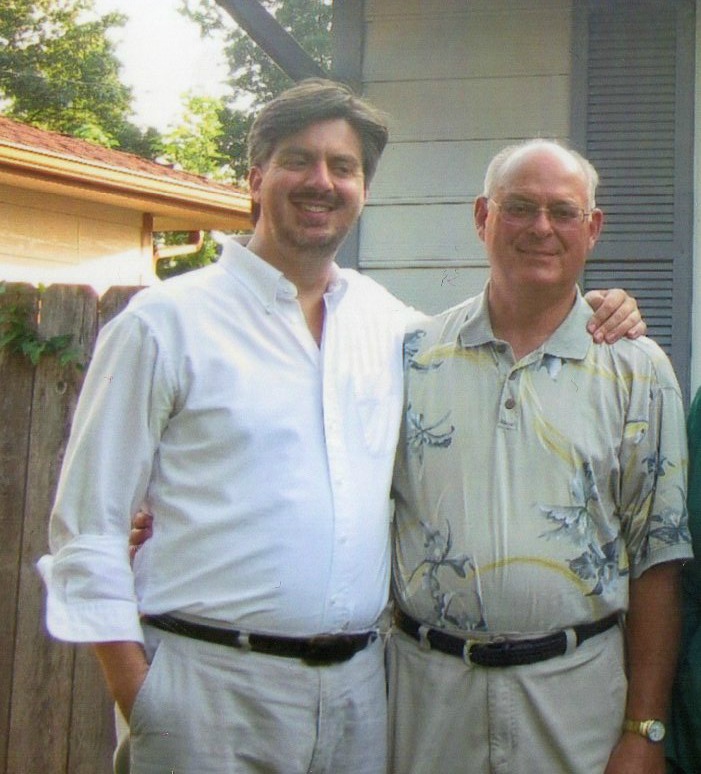 Today, February 11, my father James Russell Fox (who was named after his father, James Wesley "Little Bill" Fox, who was in turn named after his father, James William "Big Bill" Fox), turns 70. Even in this era of plastic surgery, third or fourth careers, and aging rock-and-rollers, that still counts as old. (Check it out: my father is older than three out of the four current surviving members of the Rolling Stones. That's saying something.) He carries his age well: still waking up early, still golfing almost every day, still heading in to the office for a day's work, still laboring with Young Men's organization at church. He is, seven decades into his mortal life, the most healthy and firm and disciplined and well-rounded and loving and accomplished and thoroughly good man I have ever personally known, and probably ever will personally know. I am taller than him, and have more university degrees beside my name, and I suppose can--in a few ways--see some things which he cannot. But if that is so, it is only because I am, like my eight siblings, a dwarf who stands upon the shoulder of a giant. I am lifted up by him, yet I am also in his shadow as well. So he is above me as well as beneath me, and all around me as well. Jim Fox will follow me all my life, and for all the ways we disagree, I feel that as an enormous blessing, one I am unworthy of in so many ways. Few people who have gotten to know Dad have forgotten him. His language is commanding, his presence charismatic, his sense of fun infectious, his commitment doing what he believes (or, as he would put it, knows) to be right inspiring (or infuriating), and to his dedication to his long and every-growing list of tasks--at home, at work, and most particularly at church--pretty much incomparable. Where did he get his drive, his thoughtful but also implacable strength of will? Perhaps from Grandpa Bill, a strong-willed, no-nonsense man, a cowboy and businessman and breaker of horses, a man who married the closest person to a saint that I have ever known, and was eventually converted to the Mormon church by her example and love, just in time to be baptized by my father before he left home, first to BYU and then on his mission to England. Or perhaps he got it from his mission president, Marion D. Hanks. During those two years (my father managed to cross paths with both Jeffrey R. Holland and D. Michael Quinn as a missionary, though he wasn't companions with either of them) he had more than his share of frustrating duties, having to follow up on the "baseball baptisms" of previous era of missionaries. Elder Hanks was a rock that they all, my father especially, held to, singing "Hold to the Rod" at every mission conference. (Decades later, my father and mother would make it out to mission reunions when they could, and as they told the story the assembled Hanks mission veterans would all stand and sing that hymn together as they had years before.) Or perhaps it is simply his gift. As a young man, growing up in a part-member family on a horse ranch and alfalfa farm outside Spokane, WA, in the 1950s, the story goes that he read the Joseph Smith story, decided if the Lord would grant a personal visitation to the 14-year-old Smith, why shouldn't He do the same for him? And so out to fields he went, pouring out his heart in prayer. No visitation came--but what did come, from without him or within, was a confident determination: that he would become the sort of man to whom God might grant a personal visitation. The whole of Ether 12 became one of his favorite scriptures: he would be that person; he would obey and work and love and be committed entirely. How many people do you know who are able to be truly self-made like that, who are convinced of the right thing to be and who make themselves into just that? George Washington, perhaps, with his Rules of Civility and Decent Behavior. Oh, and Batman. And frankly, I suspect my father would have a fair chance of taking them both. Do I believe in self-made men? Not really, which is probably the real heart of how my father and I differ, whatever our seemingly many (though truly, probably fewer than outside observers or even ourselves might think) personal or political or theological disagreements. At bottom, I see individuals as anything but sovereign, but rather defined by their community and environment, buffeted about by structural forces (history or evolution or capitalism or luck or God's inscrutable interventionary acts) mostly out of their control, whereas my father is a Joshua 24:15 man: you or anyone else can choose what you will, but for him, and his house, he will choose to make servants of the Lord. The fact that Dad has long been so spectacularly successful at that self-making--not just in faith, but in family-building, child-raising, business-creating, and more--has long been, and probably as will be, a reproach to me, as well as an abiding factor in the way I judge the world, and a little bit of inspiration too. I look at myself in the mirror, or I look at others, and for all my appreciation of matters of health or wealth or any other mitigating physical or psychological factor, part of me always says: "You know, you could have woken up earlier in the morning. You could have worked a little harder on that project. You could have held your tongue, visited that family, gone the extra mile, paid more in tithing, been a little more obedient, a little more loving, a little more firm." I know it, because I saw my father do it, again and again and again. And do I really know that the blessings and success he has enjoyed in so many areas of his--and through him, his family's--life were random? That they weren't, in fact, really and truly and simply just the clear and uncomplicated result of D&C 130:21, another one of Dad's favorites? He would say that he knows that to be true: that he made the choice to submit, to obey, to put it all in the Lord's hands and trust in conforming as exactly as possible to whatever law is placed before him. And the fact that blessings have followed? Well, as he would also say, it's all in the Lord's hands, on His timetable....but it is handy to know the terms of the Lord's contract with us, wouldn't you say? There is a comforting fiction amongst many of us Liahona types about the Iron Rod types, that they are all unimaginative or Puritanically serious or lacking in compassion or super-strict. None of those are true of my father. Well, maybe the last one, a little bit: for the older of the Fox family children, at least, particularly my older brother and I, my father's belt and our bare buttocks met on frequent occasions. There were rules, and the rules were to be followed. But there actually weren't, at least not in our family, all that many rules; mostly our very large, very loud, very boisterous, and very male gang ran about and wrecked havoc and got into huge fights with one another, breaking our mother's heart again and again but always knowing that had darn well better have our chores done before Dad came home from work. Even occasionally harsh discipline was an undramatic, straightforward affair; I can remember only one time, in all my years at home and in all the ways I disappointed my parents (and unfortunately, I disappointed them a lot), when my father raised his voice at me. I was probably six or seven years old, and I claimed I couldn't find my shoes or some such thing, and so couldn't go to church. Holding me tight by my arm, his face close to mine, father told me, in terms that brooked no dissent, that not going to church was not an option. Of course, I found my shoes, and I went. So, despite his occasional harshness and his relentless focus in life, not an especially strict man, and certainly not an unimaginative one, nor an uptight one. And as for lacking in compassion? Perhaps that's in the eye of the beholder, the one on the receiving end of someone else's passionate concern. I can, with only a couple of exceptions, speak as only a family member, one who has benefited from innumerable kindnesses and moments of counsel from him over the years, and as an observer, one who has gone with him and watched him, to learn from his example, as he has helped old folks move, sick people receive care, Scout projects get organized, church buildings get cleaned, sacrament be provided in prisons, and dozens more. Usually he does this good cheer and his usual unflappable determination--but sometimes the emotion overcomes him. His heart is actually pretty close to the surface, and it breaks through often. Once as a young man I attended some church meeting or another (probably doesn't matter what; at one point or another, my father has held just about every church responsibility there is), and Dad was speaking about marriage, and how there came a point in his own life where he realized he needed to change, to be there for his wife more, to do more around the home, to be more of a servant in his family as well as in the church. He wept up there on the stand, testifying of his love of Mom and how he hadn't done all he could for her, resolving to do more, with all us in the congregation sitting there kind of stunned, watching Jim Fox break down in front of us all. And another time, a harder time for me, when I'd been rejected in yet another job search, and I figured I'd planned my and my family's life all wrong, that I'd wasted years and money and was a complete failure and needed to start all over again. It was one of the two or three lowest moments in my life. My father called and, uniquely, unlike every single other friend or family member, he offered me no advice: just said, his voice all choked up, the sounds of the tears audible through the connection, that he loved me, and that his heart was breaking for me, and that he wished nothing more than to be there with me, putting his arms around me, telling that my Father in Heaven loved me and that everything would be all right. If I can, someday, show such compassion for the struggles and misfortunes of my children (which they will no more be able to avoid than human being can), and have backing it up decades of love, a whole history of firm and disciplined affirmation and commitment and kindness, as my father could...well, I will be a lucky man indeed. Not everyone loves Dad, not immediately, and not in the same way. (My wife clashed with him a lot in the early years, when his overwhelming theological determination--"you're a Fox now, not a Madsen," he would tell her--didn't go over terribly well, to put it nicely.) But he is, I think, an unstoppable force, changing the minds or at least weakening the opposition of even those who are most different from him (and perhaps I am example of that), if only because his conviction is so sure, and the grace which attends him as he goes through his days so strong. Last year I was called into a bishopric here in our congregation, and of course, as I always do, I called my father. He immediately started making plans to fly out to Wichita, so he could follow the usual Mormon pattern of ordaining me a high priest. I told him that wasn't necessary, and actually felt kind of embarrassed by the whole thing: here comes Dad, with his usual take-charge, bull-in-a-china-shop routine. But as so often when my father puts his mind to things, I'd miscalculated. He got the flights, he arrived in Wichita, and the bishop and stake presidency welcomed him in, stepping back to let him take on his role, providing one more link in the chain connecting himself to his children and his children to God. He would see nothing unusual in this; on the contrary, he was only doing what a man, a husband, a father, a provider, a child of God is supposed to do. When a grandchild dies, you are there, to provide the eulogy. When I child advances in church leadership, you are there, to give your blessing. They are yours, after all, and when something belongs to you, when you carry something or someone on your shoulders, there are just things you--assuming you have chosen to submit, to be what you believe God has told you to be--must do. And you'll do them. Or at least, if you're Jim Fox, you will. Nanos gigantum humeris insidentes, Dad. That's what I am; that's what we all are, and we love you for it, in all our different and confused ways. It's not an easy thing, being your son. But you and Mom carry us all so well; I suppose the least that we can do in return is appreciate the elevation, and deal with the vertigo. Happy birthday; here's to this one, and many, many more. Nice post. You've always had a way with words. You done good, dear. Happy Birthday, Dad. Check out the other bearded brother!!! Happy Birthday Dad (and Marj)!!!! This is really touching Russell. I must have been really feeling it because I balled like a baby. Dad Fox is a good man and I am happy to be related to him. I also told Jesse that I wish I was your sibling so you could write up some smashing piece about how awesome I am on my birthday. :) You are a talent. Russ, I finally just read this. Good stuff! Russ, thank you for helping me get to know my uncle even better. I often reflect on my second home and loved my aunt and uncle for making me feel like one of their sons. Still feel the same. Only, I had it easy, my buttocks never met his belt. :) Happy Father's Day to us all, men who learned from men before them to love God and be men of God. Saturday Night Live Music: "Look At That Girl"
Saturday Night Live Music: "Bye Bye Bird"
Saturday Night Live Music: "Ho Hey"
Saturday Night Live Music: "Stairway to Heaven"